= Ahh, I am so happy!! = “Toriaezu biiru” tte kanji! = I feel like starting off with beer! Today’s guest teachers are Charlie and Bess. They are both my Patrons and volunteered to be the guest teachers for this lesson. I love their little introduction so let me share it with you. = Konnichiwa! Charlie to Bess desu. = Hello, we are Charlie and Bess. = Boku, Charlie wa rokusai de, kosupure ga daisuki. Itsumo Bess ga boku no oyatsu wo nusumunda yo. = I, Charlie, is six year’s old and I love wearing costume. You know Bess always steals my snacks. = Bess wa, oyatsu ga gohoubi ni moraeru kara shashin no pouzu ga kimatte iru desho. Boku niwa itsumo ibatte irunda. = Bess is good at posing for photos as she gets food as a reward. She is always bossing around me. 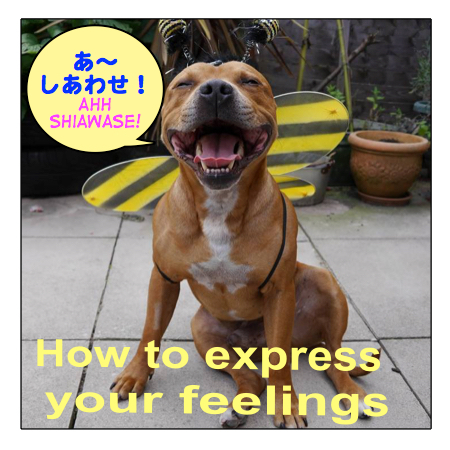 We are going to teach you how to express your feelings in Japanese. This lesson will be pretty conversational one. = Kare wa ureshii desu. It doesn’t sound natural because you don’t know how he really feels. = Kare wa yorokonde imasu. Also when you talk about your own feelings, you don’t say 喜んでいる ( = yorokonde iru). = Watashi wa yorokonde imasu. = (Watashi wa,) Ureshii desu. If the subject is “we”, it could be acceptable to use 喜んでいる ( = yorokonde iru) in the letter or formal speech. = (Watashitachi wa) yorokonde imasu./ yorokonde orimasu. = We are very happy. But still it is not that common in conversation. = Kare wa kidoairaku ga hageshii. = He shows his emotions a lot / He is a very emotional person. We often hear that Japanese people are more reserved, and we don’t show our emotions so much (in public). It all depends on the person and of course Japanese people do have all these feelings, but maybe the way they express their emotions might be a little different but at their heart they are basically the same as others. = Yay! / I am so happy! Note: In more formal conversations, add です ( = desu) after an adjective. = I am so happy!! / I feel happy! Note: あ～ ( = Ah) / ああ(= Aa) / あー ( = Ah) is an interjection to express one’s feelings. It could be positive or negative. = This is way too fun! = I am getting excited! = I am relieved . = What am I going to do? = I am sad/ I feel sad. = Sonna koto iwareru to kanashiku naru. = I will feel sad if you (or someone else) say such a thing. = I feel like crying. = That makes me cry. / I feel so sad. = I am lonely / I miss someone. = No way! / It can’t be true. = Really? / No way! / Seriously?/ Are you kidding? = Really? / No way! / Seriously? / Are you kidding? = No way! / I can’t believe it!/It can’t be true! = I can’t believe it. / No way! = That’s awful! / You are horrible! = That pisses me off. = I feel angry! / That pisses me off. / I am so pissed off. / That’s so annoying. = I am so pissed off. = I am getting depressed. = I am jealous / I envy (someone) . Note: One of the most popular slang words やばい / ヤバい/ ヤバイ = yabai = can be used to express many different emotions. This is great! / I am happy! / This is tough! / I am in a trouble. / Wow! / That’s horrible! I feel sad/happy/angry, etc in English. = Watashi wa ureshiku kanjimasu. You might say that in formal writing but in conversation you often just use the adjective or verb form to express your emotions . = How did you feel? = Donna kanji ga shimashitaka? This “feelings” could be both physical and emotional to express your feelings towards things / people / happening / events around you. = Henna kanji ga suru. = Sakki jishin ga atta mitai dakedo nani mo kanji nakatta. = There seemed to be an earthquake, but I didn’t feel anything. = Yasashii kanji no hito. = A person who looks sweet. = Kare wa nanka tsumetai kanji ga suru ne. = He seems to be kind of cold, doesn’t he? = Konna kanji ni katto shite kudasai. = Please cut my hair like (the person) in this picture. = Kanojo, kanji ga iine. = She seems nice, doesn’t she? = Kono mise wa kanji ga warui. Young people tend to finish the sentence with って感じ ( = tte kanji) . = I feel like “I’ll start off with a beer”. → I feel like starting off with beer. 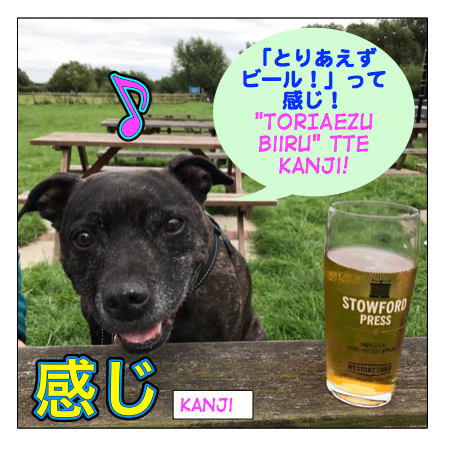 Note: 「とりあえずビール！」 ( = Toriaezu biiru) is a cliche which you use at the bar. = Ima no shigoto wa, mou iikanatte kanji. = I think I had enough with my current job. = Nanka watashi bakari ga hataraite irutte kanji. = Somehow, I feel like I am the only person who works hard. = Kanojo wa ikanimo kawaii onnano ko tte kanji no ko dayo. = She is like a typical cute girl. You use 気がする ( = ki ga suru) when you sense something / you don’t necessary know the reason why but you feel that way. = Mou shimatte iru you na ki ga suru. = I feel like they are closed now. The speaker is not sure if the place is closed but for some reason, he/she thinks the place is closed. So the speaker doesn’t have to be in front of the store. = Mou shimatte iru kanji ga suru. = Watashitachi, mou owari no you na ki ga suru. = I feel like we are over now. = Nanka omoshiroi koto ga okiru youna ki ga suru. = I feel like something fun will happen. = Sore wa chigau you na ki ga suru. = I think it’s different. / I think that’s wrong. 思う ( = omou) means “to think” but you can also use it when you go through some emotions. = Homerareru to ureshii to omou. = When someone compliments me, I feel happy. = Mou aenai koto wo kanashiku omoimasu. = I feel sad for not being able to see you again. = Tomodachi to hanareru no wa tsurai to omotta. = I felt it was hard to be away from my friends. = Arigatou, Bess Sensei, Charlie Sensei! = Thank you, Bess-Sensei and Charlie Sensei. = Kawaii shashin wo mite iru dake de watashi mo shiawase na kibun ni narimashitayo. = By just looking at your pictures makes me feel happy, too! Thank you for being my Patreon. My supporters can access an audio file for this lesson on my Pateron page and some mini lessons and quiz. Audio File for this lesson. I hope you don’t mind me asking a question on an old lesson! But I was wondering can you say 気がする without the ような in front of it? I’ve been watching a lesson on youtube and they are giving examples without it. Thanks for all your great lessons! You are an awesome sensei! Hi Maggie! thanks for the lesson, great as always! I have a question, Can you tell me why in this sentence “もう閉まっている感じがする” can’t use 感じがする? もう閉まっている感じがする” ,感じ actually means “sense/impression” so the literal mean is ” I get the sense / impression from the store that it is closed.” which you don’t say. Thank you very much! It cleared my doubts! Keep up the good work!